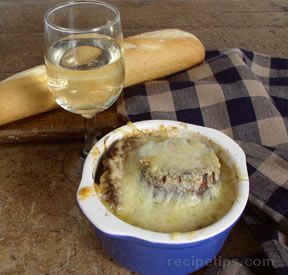 A tasty rendition of the classic French onion soup, flavored with white wine, and topped with a generous portion of melted Gruyere cheese. Melt butter or margarine in a large skillet. Add onions, leeks and garlic. Stirring frequently, sautÃ© 30-45 minutes over medium high heat until onions are caramelized and lightly golden brown. 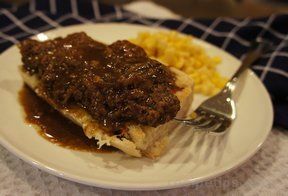 Reduce heat to simmer, add beef boullion, Worcestershire sauce and seasonings. Cook on low for 20-25 minutes. Add wine the last 5 minutes of cooking. Heat oven to 425ÂºF-405ÂºF. Ladle soup into oven proof serving bowls. 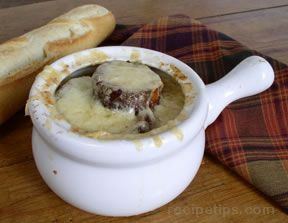 Place 2 slices of toasted bread on top of soup and divide shredded cheese among the bowls. Place filled bowls on a baking sheet with sides. 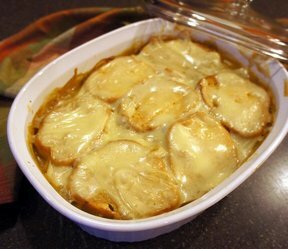 Bake 10 minutes or until cheese bubbles and is lightly browned. Serve immediately.